Earn 1 RBC Rewards point for every one dollar in purchases† you make with the card. Earn bonus points§ when you shop online at the RBC Rewards eMall™. Great for frequent shoppers who want to earn premium rewards and want premium benefits. Redeem for gift cards, merchandise items, travel rewards, and RBC Financial Rewards® vouchers with rewards starting as low as 2,500 points! Book travel rewards instantly. Only the RBC Rewards program has an online booking tool that's powered by Orbitz‡. $39 Annual Fee Rebate is available for Student Banking1 and RBC Signature No Limit Banking account owners. This CAD currency 52 is issued by RBC Royal Bank and runs on the VISA Network. The purchase interest rate for this credit card is: 19.99 percent annually and the transfer balance interest rate is: 21.99% per year. Also the cash advance rate is: 21.99% per year. 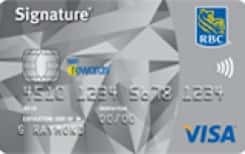 Travel cancelation is for this credit card and also travel accidents are .